Have you ever wondered what Spanish food tastes like? 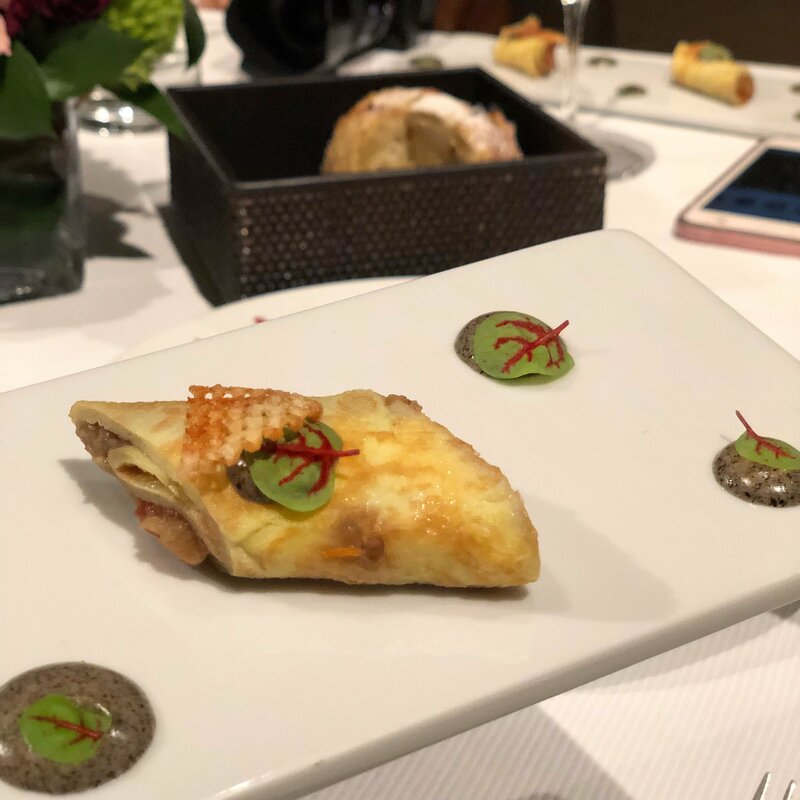 After trying Chef Aitor Olabegoya’s traditional authentic Spanish tapas, I definitely left the restaurant feeling like I took a trip to Spain! 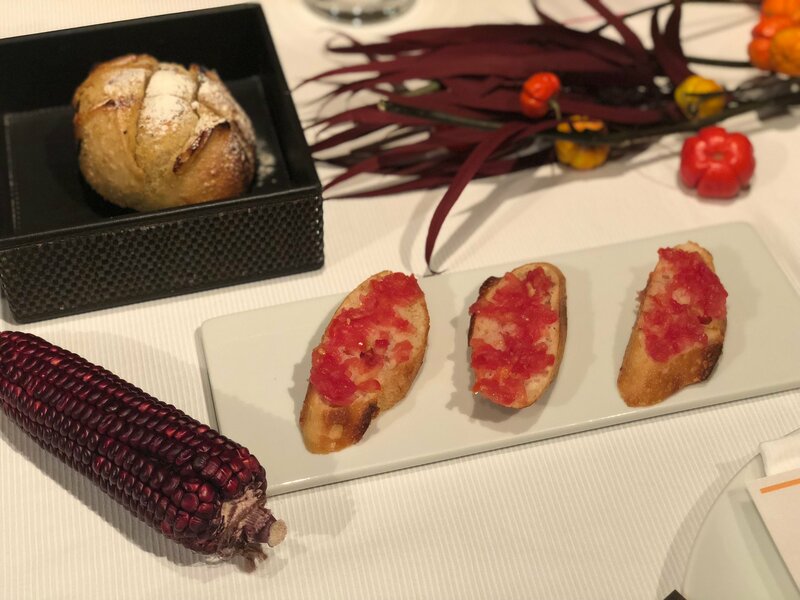 During our meal, Chef Aitor highlighted that eating Spanish food is not all about the fancy dishes and that it’s about coming together and enjoying each other’s company. Why did he decide to open restaurants in Taiwan? 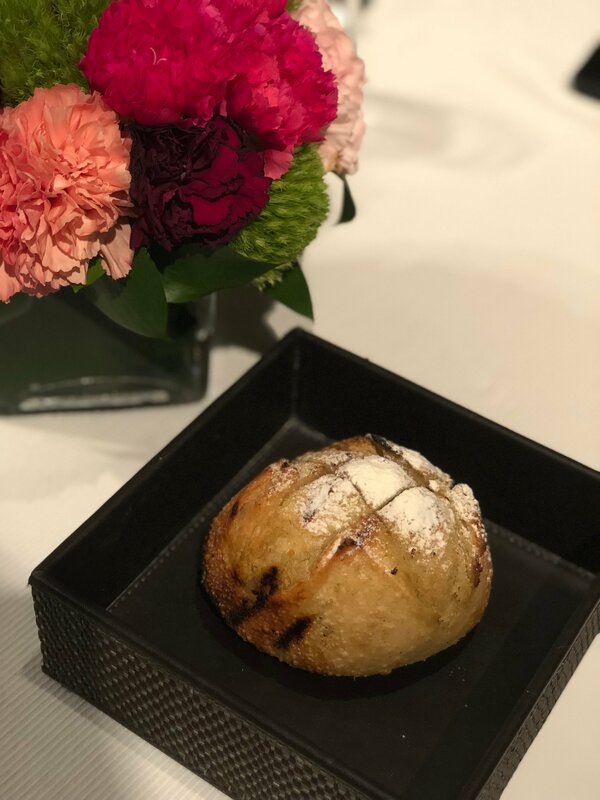 After Chef Aitor discovered Taiwan, he fell in love with the street food, the honesty of the vendors, the quality of ingredients, and commitment of each individual restaurant. First, let me show you the interior decorations of the pop-up before the menu. The restaurant is decorated with fresh ingredients! Yes, the chilis are real. 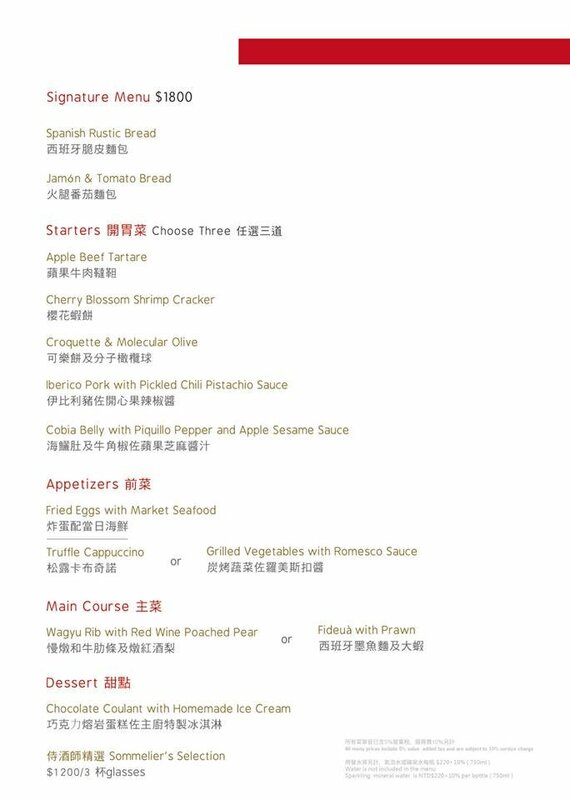 There are three menu sets you can choose from with the prices of $880 NTD (~$29.19 USD), $1800 NTD (~$59.72 USD), and $3,000 NTD (~$99.52 USD). But first, fresh bread! Bread is made fresh daily in the kitchen. Tomato Bread 番茄麵包: Add some ham slices on your tomato bread! Gildas 巴斯克吉爾達: These pickled olive and vegetable skewers are common at bars in Barcelona. 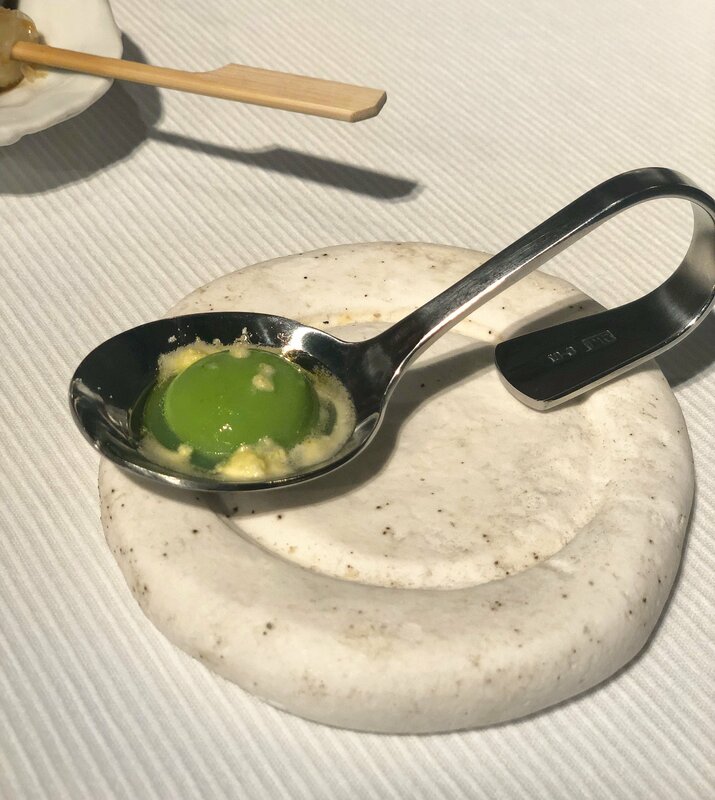 Molecular Olive 分子橄欖球: Bursting with flavor, this smooth looking pebble is made with olive purée and is to be eaten in one bite. Salmoreja 番茄冷湯: This tomato soup has a thick and velvety texture. Chorizo Lollipop 臘腸棒棒糖: The meat is put on sticks so that our fingers won’t get dirty. Like a lollipop, this dish was fun to eat! Pictured on the left: me, right: my friend. As you can see, we enjoyed the presentation of the chorizos! Iberico Pork with Pickled Chili Pistachio Sauce 伊比利豬佐開心果辣椒醬: It comes with apple slices on top! This starter was one of my favorites because of all the flavors that came with one bite. Ibérico Croquettes 伊比利豬可樂餅: Crispy on the outside, soft on the inside. Eggplant Omelette Rolls with Eggplant Mayo 茄子歐姆雷卷佐炭烤茄子美乃滋: I was quite intrigued by the eggplant mayo. The little leaves are so cute and make the dish look playful! The 5J Cinco Jotas acorn-fed 100% Ibérico ham tasted different from all the other hams I’ve tried. I am usually not a fan of ham, but Cinco Jotas’s high-quality acorn-fed ibérico ham changed my views. This is the best ham I’ve ever eaten! The black label at the end of the ham proves that the meat is indeed 100% ibérico. Ibérico pigs are black and have black hooves. 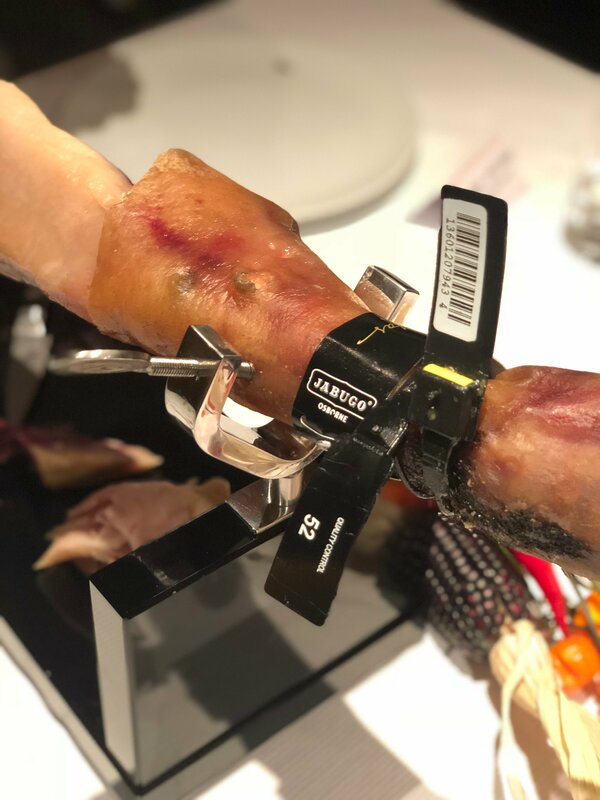 Due to the amount of fat running through its muscles, ibérico ham can be cured for a longer time resulting in more unique flavors. 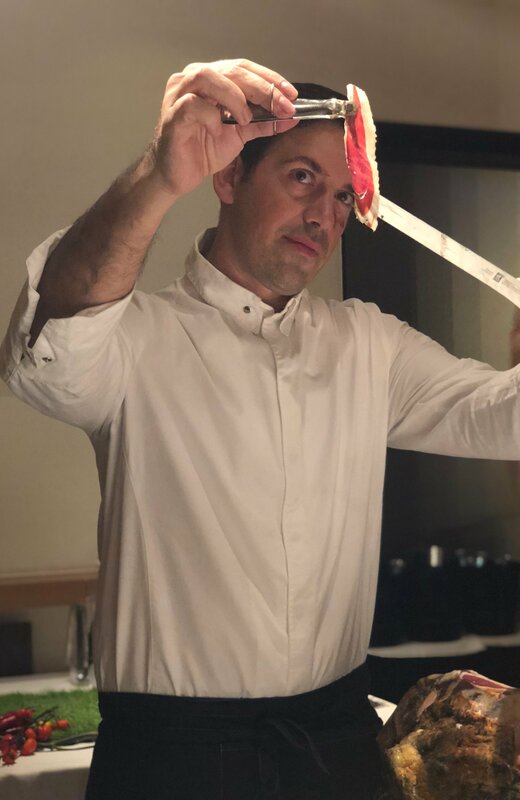 Chef Aitor himself demonstrated how to slice the ham. He says that when cutting the ham, you should be able to see the knife passing through the slice of ham. If you don’t, it’s probably too thick. The hams are cooked and grilled with charcoal in the kitchen. 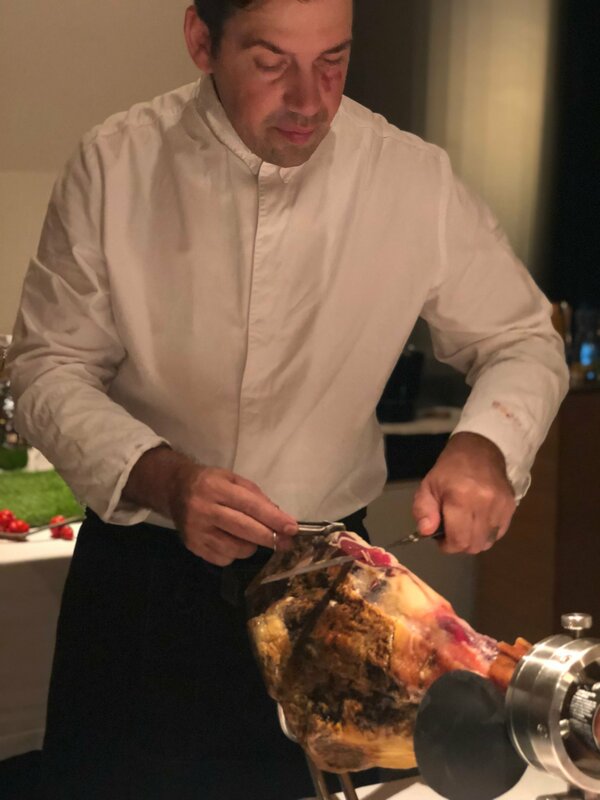 Chef Aitor showing us how to slice ham. He even let us try slicing the ham ourselves! Chef Aitor explaining how the perfect slice should look like. Here is the plate of beautifully sliced ham. Black label guarantees the ibérico ham is purebred and acorn-fed. 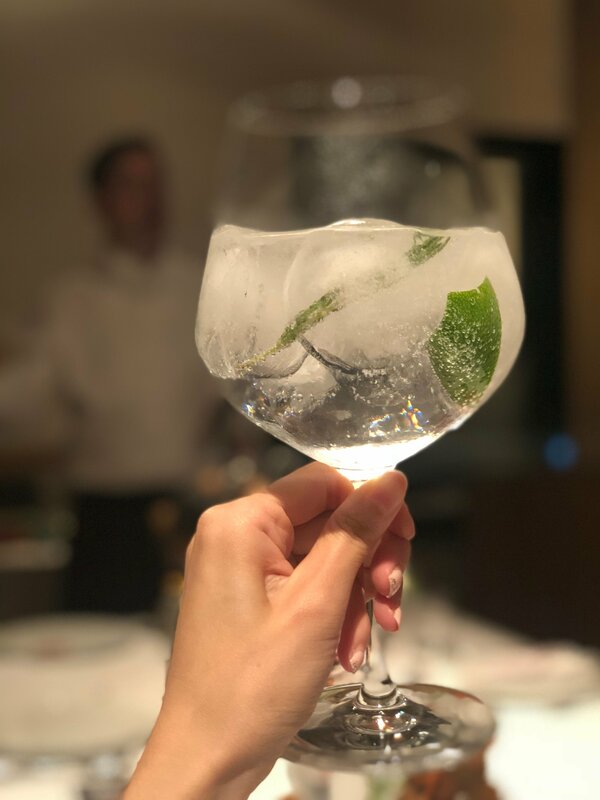 Gin Mare: This popular gin from Spain is inspired by the Mediterranean aroma with herbal flavors of basil, olive, rosemary, and thyme. 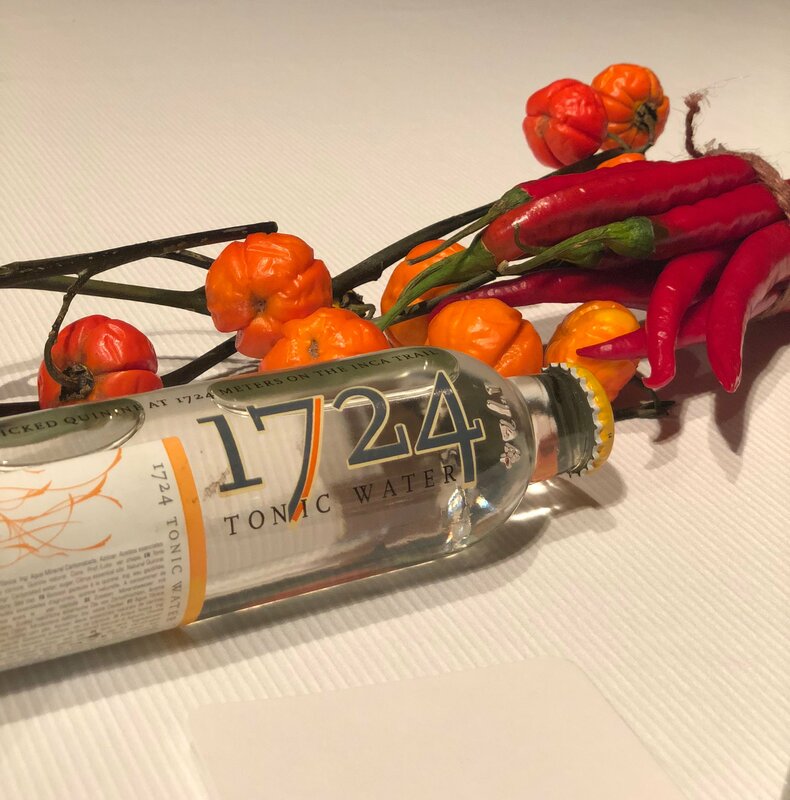 1724 Tonic Water: Not the year 1724 but 1724 meters above sea level. A perfect glass of Gin & Tonic with rosemary and lime. 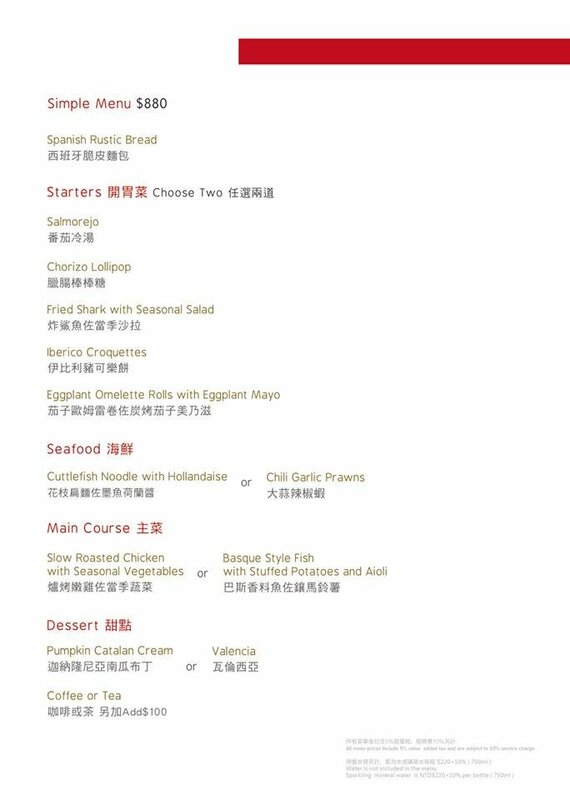 I usually don’t eat seafood, but I happily tried all the seafood dishes and did not regret it one bit! There’s so much flavor from the ingredients that the seafood didn’t taste fishy at all. 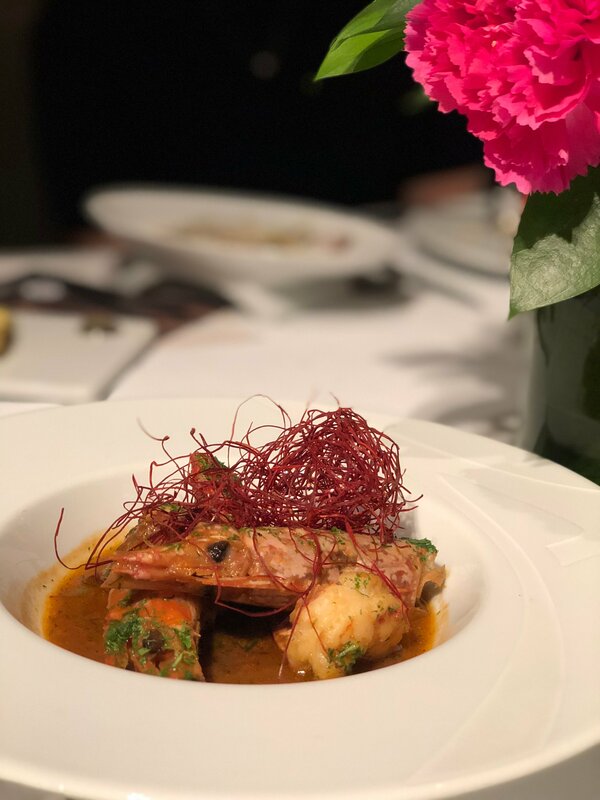 Chili Garlic Prawns 大蒜辣椒蝦: Although the word “chili” is in the name of this dish, it was surprisingly not spicy but very tasty! Josper Grilled Mussels with Garlic Mayo Foam, Josper 烤箱炭燒淡菜佐大蒜美乃滋: The meat of the mussels are tender and I liked dipping the fries in the garlic mayo foam! Fideuà with Prawn 西班牙墨魚麵及大蝦: Fideuà is prepared like paella, but fideuà is made with thin noodles. 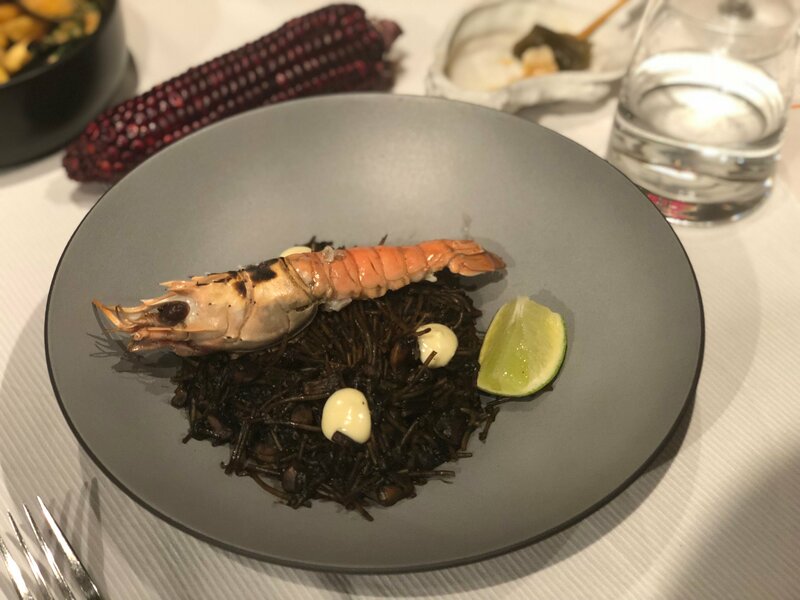 The noodles are cooked in garlic mayo and squid ink. Some people might not like the taste of squid ink, but you can add some lime juice to cancel out or lesson the fishy flavor. The lime juice added a nice refreshing touch to the overall dish. Pumpkin Catalan Cream 迦納隆尼亞南瓜布丁: This was one of my favorites! The dessert is made of pumpkin cream with ginger ice cream. It is then torched to make the top crispy like a crème brûlée. Pavlova with Grapefruit Mint Sorbet 帕弗洛娃佐葡萄柚薄荷雪酪: With meringue on top, this cooling dessert is perfect for the season! Chocolate Coulant with Homemade Ice Cream 巧克力容顏蛋糕佐主廚特製冰淇淋: The last dessert is the classic chocolate brownie with peanut butter ice cream! To finish the wonderful meal, we got to choose coffee or tea. I went for the nice soothing cup of coffee. 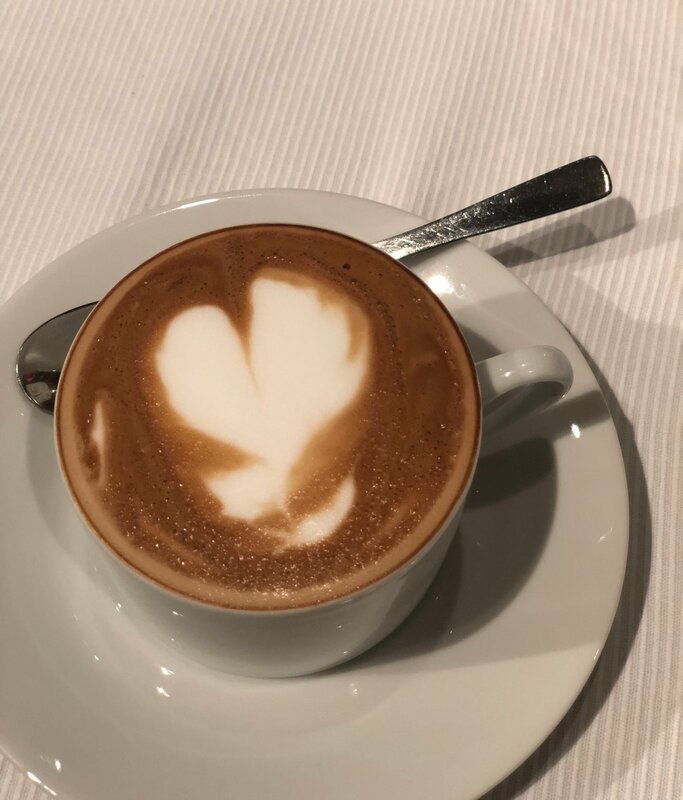 Cappuccino 卡布其諾: This cappuccino definitely kept me energized throughout the rest of the day. 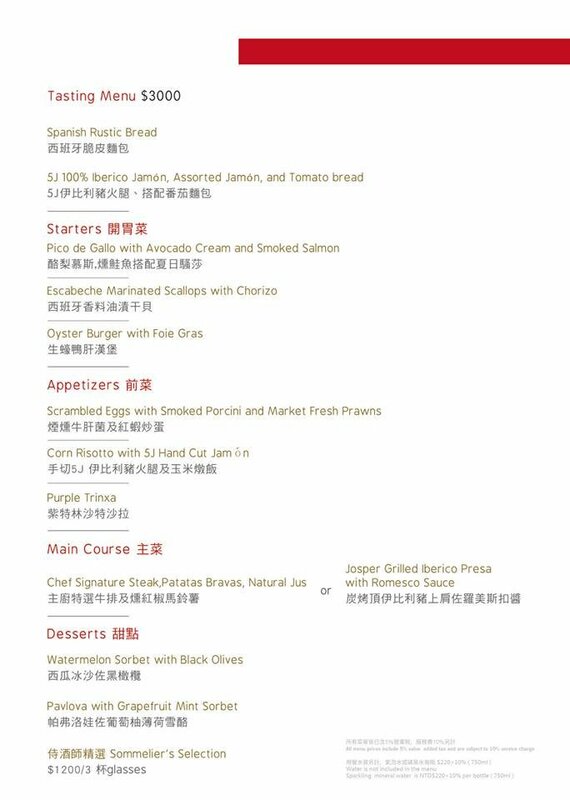 TABLE by GastroJoy pop-up is available inside the 4th floor of Taipei 101 building from the beginning of May to the end of June this year. You won’t want to miss it! Update: GastroJoy pop-up has been extended! Special thanks to Joyce and Chef Aitor for being amazing hosts! Previous Lacuz Thai Fusion Cuisine, Lacuz 泰食-樂 泰式料理餐廳 – It’s AYCE Thai-m! Next WHAT’S GOOD SAN FRANCISCO?